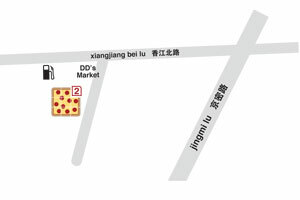 Address：Xiang Jiang Bei Lu No.Jia 2 bld Cathay View Plaza, behind DD’s Supermarket. From the city: Take the airport express to the Beigao exit, then get on Jingmi Lu. Xiang Jiang Bei Lu is the second intersection. Turn left, and Pie Squared is behind DD’s Market in the shopping complex. Copyright © 2013 Pie Squared.